With house guests, being busy with the house project, and having to deal with insane jackhammer noise in our temp quarters, I haven’t been much of a blogger lately. Lots of clean-up to do. Went to get a copy of The Night Guest for the summer read along (see below) and ended up walking out with a Messud-she isn’t my favorite, but good enough to keep trying; A Cathleen Schine novel which is turning to be perfect summer reading; and the latest from Kathleen Tessaro who does wonders incorporating fashion into wonderfully readable, smartish, rom-coms. Some of you may recall me blogging about this book in 2011. It was a favorite from my childhood. It’s about a WWII-era refugee family in Europe who make their home in an old railroad car and includes a pet goat named Rachel. I love this book. The other day I was in our neighborhood dry cleaners and I saw three books on the window ledge that looked like they were some sort of lost and found pile. It just so happened that this hard to find book, one of my favorites, was sitting right there and free for the taking. The dry cleaner was more than happy to let me have it. A happy story for sure, but it turns a little bittersweet. The book is a discard from the Chevy Chase Library just across the street from the cleaners. I wondered if maybe it was the same one I checked out in 2011. When I went back and looked at my post from that re-read, I realized that the copy that I now have in my possession was the same exact copy I checked out in 2011. It was the only one in the DCPL system, and now, sadly, it has been discarded. Never to be read by another young mind. Big sad face. On the other hand, the book found its way to me, one of its biggest fans. Is an unreliable narrator the same thing as a crazy narrator? I think in the case of this novel the answer is probably yes. One of those situations where you find yourself rooting for the main character and then you begin to realize she may not be worth rooting for. A twenty-something woman who decides to start living her life boldly like the characters in Treasure Island which she has just read for the first time. Turns out she is a bit of a misguided, mixed-up, lazy, nutter. It’s funny and frustrating. Reminded be a tad bit of After Claude by Iris Owens. I am a big fan of Patchett and there were moments in this collection of mostly previously published essays that I enjoyed. I particularly liked the essay about opening her bookstore. But overall I often find collections like these a tad boring because I feel like they aren’t quite as topical as when they were written. Many essays don’t age very well, or they seem less interesting or important because the heat of a particular issue has long since faded. This is really no knock on Patchett, there are many authors and essayists of grander stature who have bored me in this way. But I guess if this compilation gives her more time to work on her next novel I surely won’t complain. After I read and loved Americanah I went out and bought all of Adichie’s other books. Half of a Yellow Sun takes place in the years leading up to and during the Nigeran-Biafran civil war. It is a brilliant novel that definitely takes the reader on an emotional roller coaster. This is not melodrama, however, it is just really good writing about a really civil war where millions of civilians died. Adichie is good with plot, characterization, pacing, language, and believe-ability. She deserves to be a superstar. Joshua Ferris’ most recent novel, To Rise Again at a Decent Hour. His first novel Then We Came to the End is one of my favorites of all time. His second novel I found rather conventional but still enjoyed it very much. This one? I’m about half way through and I really am not very interested in going back to it. And I even bought it in hardcover. Some listeners to the podcast The Readers were on Goodreads clamoring for a summer read along. Somehow Simon Savidge said yes, a consensus was formed, and I had to go find myself a copy of The Night Guest by Fiona McFarlane. On page 56, I am glad I forced into reading this one. It is pretty fascinating and enjoyable. And it is nice to read something that takes place in Australia. If you want to join in pick up a copy and read it by August 20th. Then send any questions or comments for the discussion to me here or check out the topic on The Reader’s Goodreads message boards. Simon is going to be in DC at the end of August so we may end up recording it in the same room. 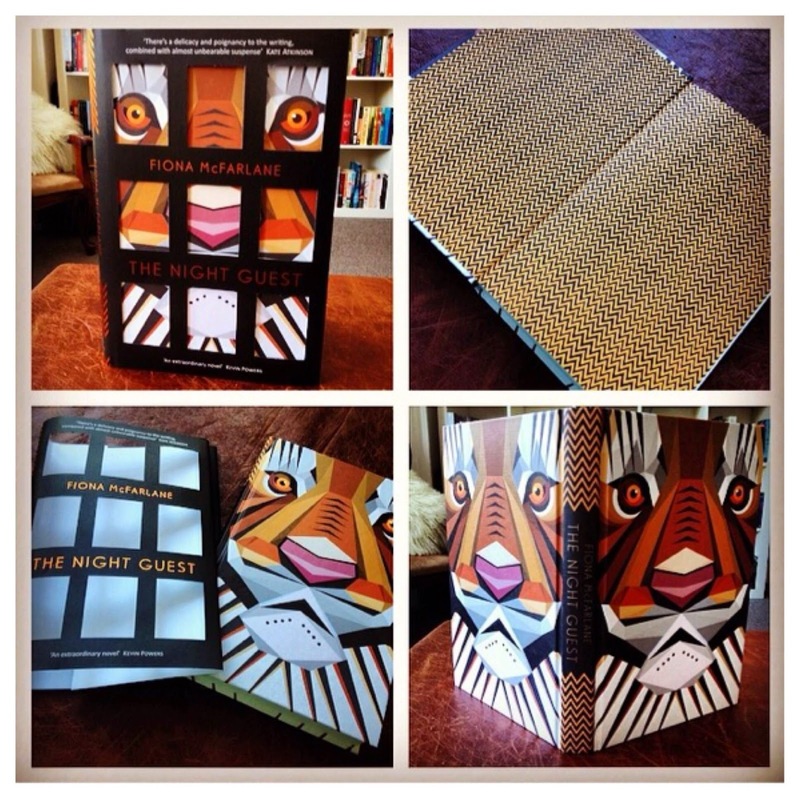 The much more interesting UK edition of The Night Guest from Simon’s blog. I could give you an outline of the plot, but if I haven’t convinced you yet to pick up the highly enjoyable Eric Ambler, I probably never will. Previous Article Is it wrong to read everything you like all at once? As one who has been on the road for the last week, I haven't been much of a blog-reader, so that makes us even. 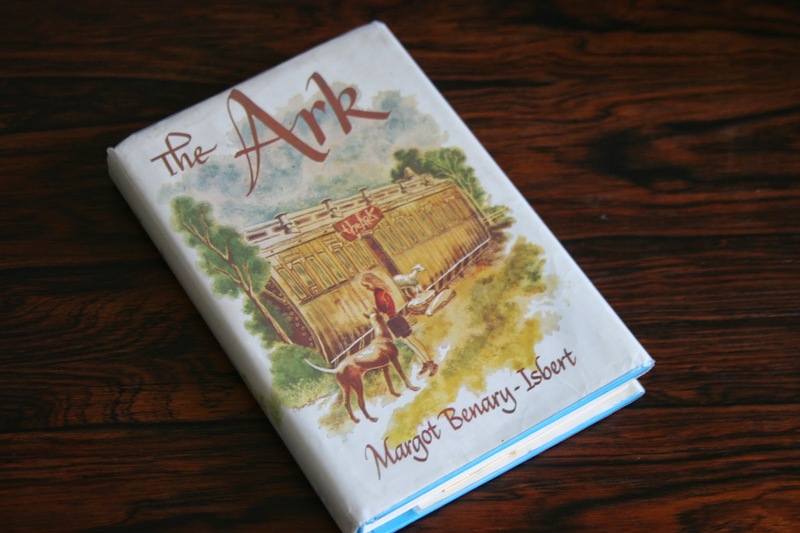 So glad that you found a copy of The Ark (although agree with you on the sadness of it being out of circulation). I still hunt for it on a regular basis when I'm digging around the used book stores. As for Eric Ambler, you definitely piqued my curiosity and I found one of his titles this week on my travels, Epitaph for a Spy. I hope to get to it soon, but I also (on your podcast guest's recommendation) picked up the first two Robert Muchamore CHERUB titles at the library thinking to read them with my son. I'm set for “spy reading” – at least for this week. :) You've convinced me to try Adichie as well, but I've got to make some progress on the current summer stack first. Happy Reading to you! 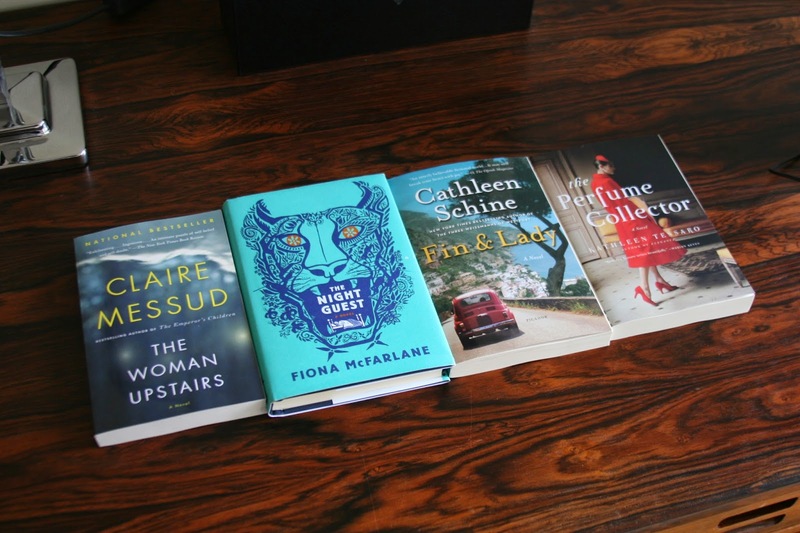 I really liked – The Night Guest; Woman Upstairs and Fin & Lady — so enjoy. Listening to Ann Patchett audio This is the Story of a Happy Marriage now — she reads it and am enjoying it so far. I really enjoyed The Perfume Collector. It made me want to find a real perfumist so I could have a special scent made just for me. I loved The Woman Upstairs and, since I enjoyed The Three Wiessmanns of Westport so much on audio, will probably choose that route for Finn & Lady too. You know I believe that books you are meant to have will always find their way to you. While it is sad that it is no longer in circulation, far worse things could have happened to it then becoming a treasured part of your library. As for the rest of these new lovelies you have? I have not read a single one. :) Bookstore soon? And we don't have to eat in the basement. I just purchased Americanah the other day at Barnes and Noble. It looked so good that I paid full price for it….I often borrow books from the library. I'm looking forward to reading it. If you know anyone with small children you could always gift The Ark on to them to pass on the story. Or hang around a playground looking for some deserving child to give it to – but that might look dodgy. I really want to read that book of essays by Patchett. You've reminded me I need to get a copy. Also that's good to know about the new Joshua Ferris. I haven't read any by him but my partner loved his first book too. I was thinking of giving this a try, but will definitely go back to the first if I am going to read him. I will vouch for the Claire Messud book “The Woman Upstairs” being a great book. I do think, however, that a woman would appreciate its intricacies more than a man. I gave up on the Joshua Ferris! The epilogue is good though – go Betsy! Half of a Yellow Sun is wonderful, I agree. More people should read it. I found Eric Ambler years ago, I think through an NPR story, or maybe a blog post, but I've been grabbing his titles in second hand stores ever since. You can still find him in very cheap traditional paper-back editions. When you go to Politics and Prose do you get beer and pie? That's the store with a bar/restaurant in back right? Love that place. There were more than a few titles Ron and Simon talked about on The Readers that were completely unknown to me. So far, with TNG read, and F&L in the process, I am feeling good about that particular book buying trip. I could tell all kinds of scent related tales, but I think I will save them until I read the book. I only know about Schine because of Nancy Pearl. So far so good. And to think if the book had been pulped! It really was a bookish miracle. I almost never buy new hardcover books, but I sure didn't regret buying Americanah. Come to DC and I will give you my copy of the Patchett. I don't think it will survive a cull. I would only want to give it to a child if I knew they would actually read it. I don't know any kids like that. The dream sequences are shortish, and let's not forget that I agreed to read this book kicking and screaming. I mean really, a tiger?! At least it didn't talk. I did enjoy it, but am saving all my thoughts for our podcast in August. I officially put the book away. One step away from being given away. I never find Ambler anywhere here in DC except in the newish editions by Vintage. Politics and Prose has a café but not the one you are thinking of. You are thinking of Kramerbooks at Dupont Circle. Not only can you get beer and pie, but on the weekends they are open 24 hours. I really think that Persephone need to reissue it. I had the delight of seeing Adichie at the Hay festival a few weeks ago. She is such a delight to listen to – thoughtful and witty. I loved Americanah too – have Half a Yellow Sun waiting for as a holiday reading treat. I knew you didn't mean it to be an insult. I was giving you a hard time. In general, I don't have much interest in author talks, but I would love to hear Adichie talk about her work.